Nearly 37 million people watched the 87th Annual Academy Awards on Sunday, down from 44 million last year. Many reasons may have contributed to the viewership drop, everything ranging from the show’s host performance, to the celebrity of the actors themselves, to the types of films that were nominated. Ellen DeGeneres’ selfie at the 2014 Annual Academy Awards. For many pundits that offered critiques of this year’s Oscars, reviews bordered on ho-hum and boring. But what may have been seen as a luck-luster TV event, much of the action was happening on social media, more so on Facebook than on Twitter. It’s hard not to watch a live TV event these days without being asked to tweet this or hashtag that. This year’s Academy Awards were no exception. While Twitter generated far less interaction than last year, 6 million tweets were posted about the 2015 #Oscars, still a fairly significant number of impressions. 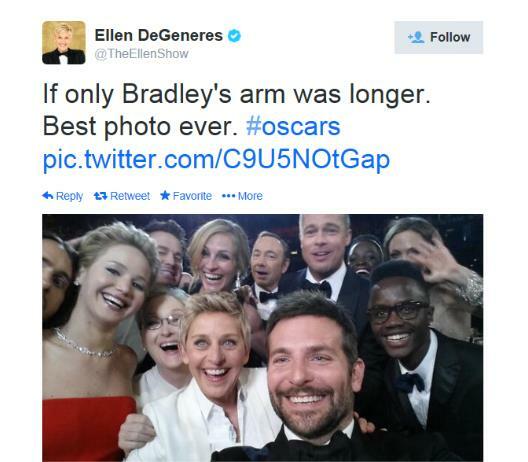 Remember last year’s Ellen DeGeneres’ selfie that actually “broke” Twitter for 20 minutes? The talk-show host’s photo was retweeted 3.3 million times and seen by 37 million people. Experts valued the exposure to Samsung (a sponsor of The Oscars and the type of smartphone that was used to snap the photo) in the hundreds of millions of dollars. While having several of Hollywood’s top A-list celebs in the photo certainly helped it go viral, the tweet nonetheless was a successful integration of TV and social media. Facebook this year received more engagement, where 21 million people generated 58 million posts, likes or comments about the Oscars, up from 11.1 million users in 2014 generating 25 million interactions. The social network this year also introduced its Trending Oscars experience that allowed fans to connect in real time about Sunday’s show, which may have led to the huge engagement. Clearly, the social experience between Twitter and Facebook is much different, although one thing is abundantly clear for both: engagement. Today’s social platforms enable two-way communication in real time like never before. And because tweets and posts are searchable and have a long life span – which may not always be a good thing – the value of engagement is much greater. For the naysayers about social media, and there are those still out there, new media platforms are extending brands way beyond the TV set and onto the Internet, where discussions continue on for days and even months. For TV in particular, social media may be giving it a sorely needed boost, especially since fewer people than ever are watching television. Good content doesn’t hurt either. Either way, social media is here to stay and actually making TV fun again. Anonymous: Very good article. Nicely done.